There are 4 reputable betting exchanges you can use for matched betting. Whilst completing the earlier Welcome Offers it is best to stick to one exchange (most likely Betfair if you have started with them) as this means your exchange balance keeps growing, rather than spreading it too thinly across different exchanges. However, you may have heard about other exchanges and may be wondering what is the difference between them. So in this guide, you will learn the pros and cons of each exchange and most important, which exchange(s) will help you make the most profit! Low commission rates are very helpful to maximising matched betting profits. For example, if you place a £1,000 worth of lay bets in a month, every 1% commission less means you save £5 in commission paid. Given once you move on to Reload Offers you can make place up to £10k in lay bets every month this represents a very significant saving. *Matchbook charge 1.5% on winning and losing lay bets so enter 1.5% into the back and lay commission in the calculator. If you use OddsMonkey or looking to give it a try, please see the Smarkets 0% and Matchbook 0% blog posts for details on receiving the 0% commission. Is Betfair's 5% commission justified? Check out the below sections for details on each of these areas. All 4 exchanges have plenty of liquidity (the amount money being traded) on the main Match Outcome market, so you won't have any problem getting close lay odds on this market. However, for some of the smaller markets, only Betfair and occasionally Smarkets will have high enough liquidity to ensure there is sufficiently good lay odds. Smarkets layout is slightly larger for each market which makes it very easy to follow. Matchbook's layout is a bit on the small side compared to Betfair and Smarkets which does result in the occasionally leaning towards the screen! Betdaq is also a smaller than Betfair and Smarkets and it's also slightly less appealing given the fainter use of colours and the %s along the top that aren't helpful for us matched betters. Being able to place your lay bet without fail is critically important - nobody wants to place a back bet if you can't place your lay bet! Fortunately all 4 exchanges are very reliable for 99% of the time. The only issues can occur during the absolute peak times during the year, for example during the Grand National and opening day of the Premier League. Betfair is the most reliable during the absolute peak time so I would recommend using them for the biggest events. For example, whilst Smarkets has made very significant improvements over the past 1-2 years, matched betters were unable to place lay bet minutes before one of the biggest Ascot 2018 races, causing some panic! 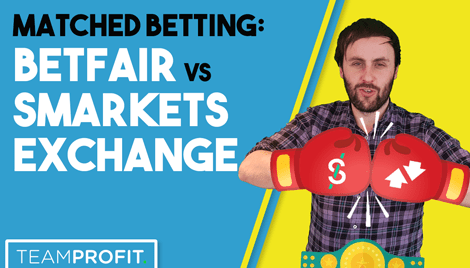 Given the above comparison, you can understand why the two leading exchanges are Betfair (for their additional markets, appearance and stability) and Smarkets (low commission rate and appearance).